In the earliest days of the drum kit, the ride cymbal provided the pulse behind the elaborate grooves of blues, jazz, and rock 'n' roll. Then Ringo and his peers came along, and the rock and pop drumming paradigm switched to the hi-hat-led backbeat. However, the ride is still an absolutely essential part of the kit, giving a very different sonic flavour to the hats. Bigger, thicker and heavier than its crash cymbal siblings, the ride stands on the opposite side of the kit to the hi-hats. The subtle tonal variations that can be elicited across its sizeable surface make it a surprisingly expressive instrument. Unless you're programming jazz (which would be quite a weird thing to do), most of the time you only really need to be aware of two main sounds: those generated by the bow and the bell. The bow is the main body of the cymbal, delivering a clear, sustained 'ting' when struck with the tip of the drumstick; while the bell - the lump in the centre of the cymbal - is clobbered with the shoulder of the stick for a shorter, louder, more rounded 'clang'. Using both sounds, individually or in combination, you have some great contrasting options to the hi-hats for use in choruses, middle eights, etc. 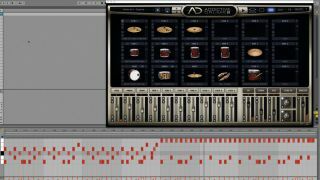 In this walkthrough, we'll lay down some basic rules and techniques for programming ride parts authentically in a multisampled drum kit. Step 1: The 'standard' use of the ride cymbal in nearly all genres apart from jazz is as a sonic 'step up' from the hi-hats in choruses, middle eights, guitar solos and any other part in which the perceived power of the band is meant to increase. Step 2: Programmed at constant velocity, hi-hats never sound realistic, and the same is doubly true for the ride cymbal. Usually, a drummer emphasises the beat on the ride, with offbeats played quieter, and to fully recreate the sound of the ride, you need a proper multisampled source - we're using XLN Audio's Addictive Drums here. Step 3: Although nailing the beat with the ride is the 'norm', switching that emphasis to the offbeats instead can really bring the funk. The bell of the cymbal is frequently more effective for this than the body. If the groove feels a little sparse, though, try programming quieter onbeat hits on the bell or the main body, too. Step 4: While the ride cymbal is primarily an alternative to the hi-hats, there's nothing stopping you using both together. For example, try throwing in the odd 16th-note open hat for rhythmic embellishment. There are no rules - except that with only two sticks, you can't hit the hi-hat, ride and snare at the same time, of course. Step 5: When even the energy of the ride bell isn't enough to make the point, a drummer might turn to striking the edge of the cymbal with the shank of the stick for a huge, crash-like wash of sound. You'll probably want to greatly reduce the velocities of the in-between offbeats unless you're working on a metal track. Step 6: Double-handed 16th-note hi-hats are a drumming standard, but only the most experimental of drummers would ever even think to apply the same technique to the ride cymbal. Slower tracks, where the 16th-notes could be played using one hand, are fair game, though.